At Kool Kids our focus is to nurture your child’s individuality, creativity and aspirations with activities that are designed to develop numeracy, literacy, fine and gross motor skills, as well as social engagement. A constant drive to investigate new and innovative early learning methods means that we can proudly provide exciting tools such our state-of-the art, interactive iSandbox and our brand new literacy program, I Love Reading. The iSandbox is an exciting, new learning tool that opens a world of possibilities where children explore the sand to discover music, texture and sound. iSandbox lets lava flow, oceans swirl, grass grow and bubbles blow! We understand how important school readiness is and want to support our children and their families in every possible way, to ensure they have the very best start! Driving leading-edge learning programs and initiatives at Kool Kids, means your child can take full advantage of interactive, new programs such as ‘I Love Reading’ (ILR). At Kool Kids, we want to inspire your child’s imagination and constantly search for innovative ways to develop important skills. We integrate the most up-to-date theories and tools into our curriculum, placing your child at the leading-edge of pre-school learning and development. Children are intrigued by sand play. They sift it, build with it, pour it, enjoy the feel of it, pretend play with it and explore how it moves. The iSandbox uses Augmented Reality to take a traditional sandpit to magical new proportions. A unique interactive software program, projector and depth measuring sensor work together to transform the sandpit into realistic 3D textures of water, mountains, volcanoes, snow and many other objects. This is coupled with beautiful music and the sounds of nature. How does iSandbox inspire imaginations? As your child digs, moves, manipulates and explores in the iSandbox, the world or scene that has been created changes and shifts intuitively. The initial story or scene is constantly altered by their ideas and actions. Because no two experiences are ever the same, your child can choose their own adventure. What they experience and learn truly depends on their imagination and creativity. How does Kool Kids use iSandbox as a learning tool? 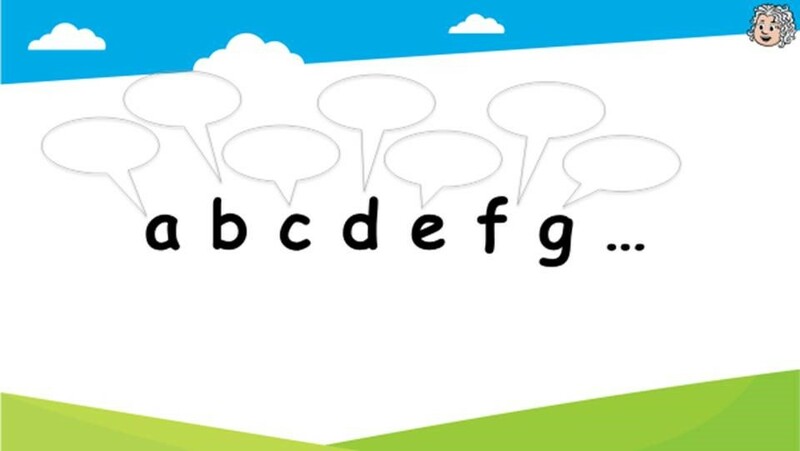 At Kool Kids our educators specifically use this interactive tool to enable children to express ideas and to foster rich language use. In response to their evolving ideas and interests, we anticipate and extend children’s learning via open-ended questioning; encouraging feedback and dialogue about the experience, challenging their thinking and subsequently guiding their learning. What would happen if you…? Why do you think this happened…? If you dug a bit deeper, how do you think it would have changed…? This teaching theory is cemented in Lev Vygotsky’s (1896-1934) belief that you can use ‘scaffolding’ to build on a child’s current knowledge. By helping a child with open-ended questions, we give them the resources to get to the next piece of knowledge when they are ready for it. At Kool Kids, all educational programs are guided by the Government’s Early Years Learning Framework. Our iSandbox curriculum was developed to incorporate ‘Learning Environments’, ‘Learning Through Play’ and ‘Intentional Teaching’ specifically. You can find out more about the Early Years Learning Framework. This dynamic scene replicates the coming of the Ice Age. In 30 seconds, the colour of the sand changes into ice from the highest points to the lowest. When more than half of the surface is covered in ice, the snowstorm begins. This scene explains the natural phenomena of snow, ice, temperatures and how they depend on the landscape, as well as how they have influenced the modern world. In this mode, sand is highlighted according to heights, replicating a true landscape. There are five landscape layers: water, sand, grass, rock and lava. Changing the sand terrain triggers different colours projected onto it. Playing with sand becomes an even more creative and colourful process. This mode is great for learning the colours used on world maps. The sand is coloured according to height and depth, with the lower parts being blue and the highest red. The Cartography mode boosts children’s visual and creative thinking and teaches them to read maps more efficiently as well as creating an interest in nature. The volcano scene is very entertaining and colourful and can be used to learn about the nature of magma, lava and rifts in the earth’s core. This mode includes the option to highlight by height as well as to create an interactive volcano. To create a volcano, your child will need to build a high mountain with round top and a vent. When the volcano erupts, realistic lava starts flowing down the slope and gathers in the plains. Here, children will learn about natural springs as a groundwater source, where pressurised water emerges from the ground in a steady flow. This mode lets them create rivers, lakes, floods and canals. The interactive water source is very realistic, as it sparkles and flows like real water would. Experience a replica of the living and breathing ocean. Imagine exotic fish and sharks swimming in the water, crabs and turtles roaming on beaches, corals flourishing on the ocean floor and palms growing on islands. Every animal has its own habitat and behaviour. Days are changed by nights – animals are highlighted and shadows grow on land. This mode demonstrates how nature changes over the year in Winter, Spring, Summer and Autumn. Children learn about natural phenomena including why it snows and rains, why leaves turn yellow and what the typical temperature for each season is. Africa is inhabited by many plant-eating animals, as well as by predators chasing them. This scene provides children with an opportunity to discover wildlife in different climate zones of the continent, ranging from equatorial forests to sandy deserts. This mode will help children learn the names of forms and colours. Different figures are projected onto the sand and their colour changes depending on the height of the sand. Colours and Shapes is a great mode to teach kids the basics of a foreign language including colour theory, geometry and so on. Which child does not love popping balloons? In this mode, colourful balloons appear on the sand and players should pop the ones with corresponding colours to the frame. The frame colour changes every 30 seconds and several players are able to pop balloons at the same time. In this mode the sandpit is divided into day and night. This allows children to compare the different times of the day. They will learn about the sun, moon, sky, stars and constellations. At Kool Kids we are always searching for new ways to inspire your child’s imagination. Our focus is on play-based learning, with activities designed to develop important skills including literacy and critical thinking. We also understand how important school readiness is and want to support our children and their families in every possible way, to ensure they have the very best start! What is ‘I Love Reading’? ILR aims to bridge the gap between early childhood education and primary school. It utilises new literacy methods to help children learn every sound of every word in the English language. 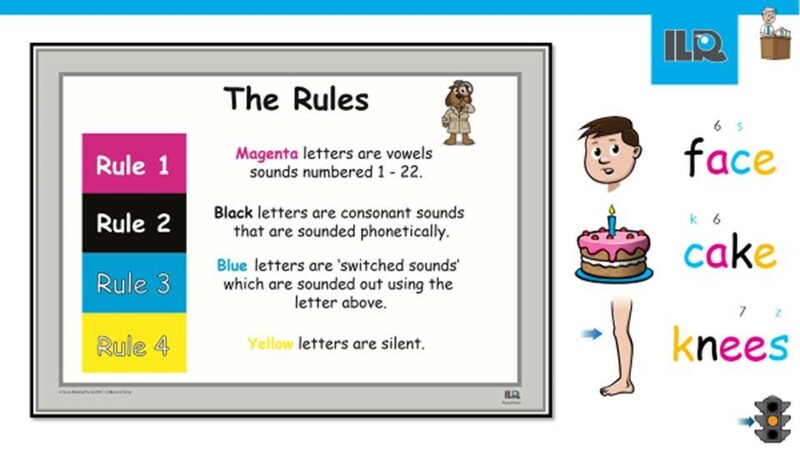 We achieve this via a fun, simple coding system, where colours and numbers are used to identify phonetic sounds. Beyond teaching children to decode words, ILR also equips early learners with the skills to actually understand what they are reading. Removes all rules of inconsistencies. ILR is currently being used in our Kindergarten and preschool rooms. How does Kool Kids use ‘I Love Reading’ as a learning tool? 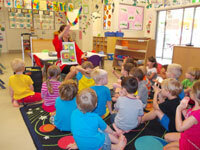 To develop lifelong learning skills, Kool Kids incorporates ILR characters into daily practice. ILR sessions involve the learning of sounds via fun, hands-on sensory and motor activities. To grasp the letter C for example, we may create it out of play dough before writing it down. We also introduce loveable characters to help master sounds, letters and words. Unique traits of any given character will guide children’s thinking and embed elements of social and emotional learning into everyday play. 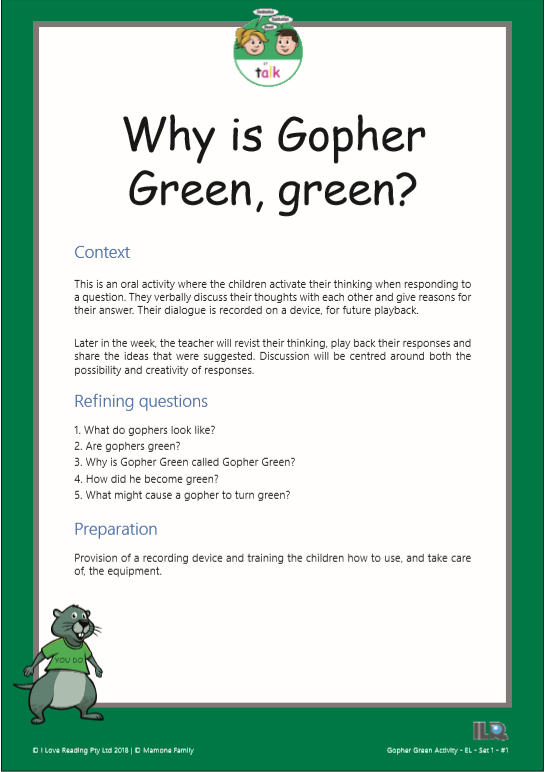 Using important comprehension strategies, our educators will also prompt ideas and use questioning to foster creative and critical thinking skills. ILR combines proven literacy methodologies with an innovative approach to learning. Even better, new research has revealed that children who practice phonological awareness, are two and a half times better at converting sounds into letters. 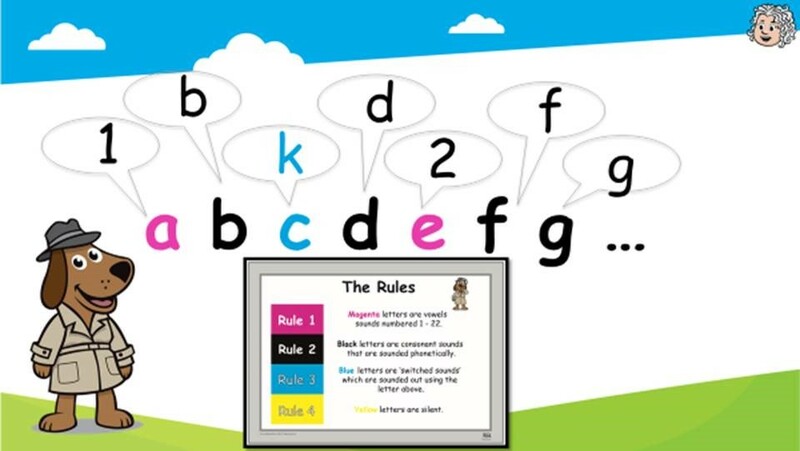 Using the English Phonetic Code ©, ILR delivers a unique colour and number system that helps identify the key phonetic sounds in the English language. Comprising 18 consonant sounds, 22 vowel sounds and seven digraph sounds, ILR is essentially a system of universally recognized colours and numbers that allows every English sound and word to be ‘read’. This means that regardless of its complexity, even early readers have the immediate ability to correctly pronounce any word. We know that animals have a name and they also make their own unique sound. 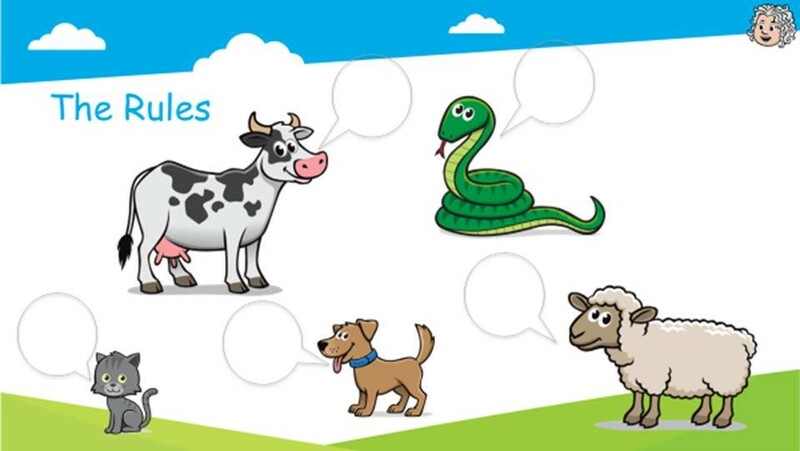 For example, a cow says, moo; a snake says, sss; a cat says, meow; a dog says, woof and a sheep says, baa. Letters also have a name and a sound. The English language is a little tricky though in that some letters may make more than one sound. 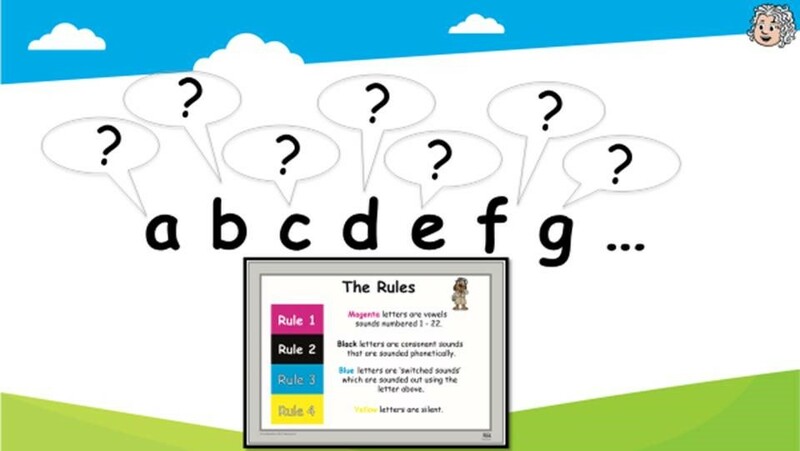 We have four ILR Rules, which help us to know what sound each letter makes. This helps to remove complexity from the English language. 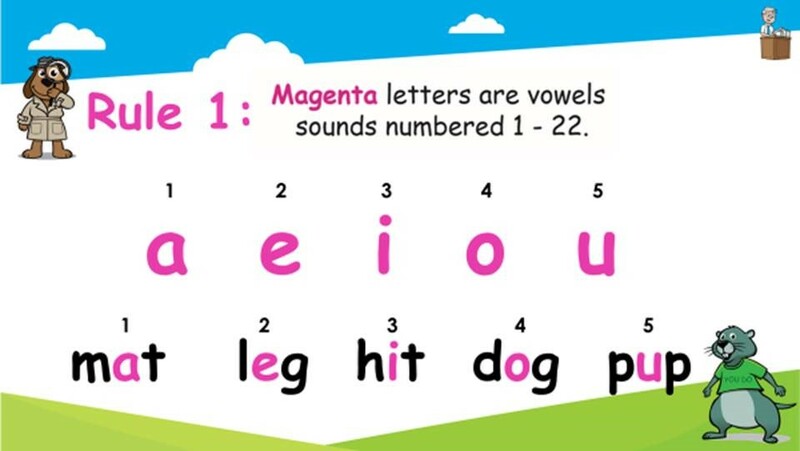 Rule 1: Magenta letters are vowel sounds, numbered 1 – 22. Each vowel sound is linked with a number. When a reader sees the number 1, they know that letter (regardless of spelling combinations) makes the short ‘a’ sound. If a magenta letter has a number 2 above it, it makes the short ‘e’ sound etc. These sounds are taught intentionally. 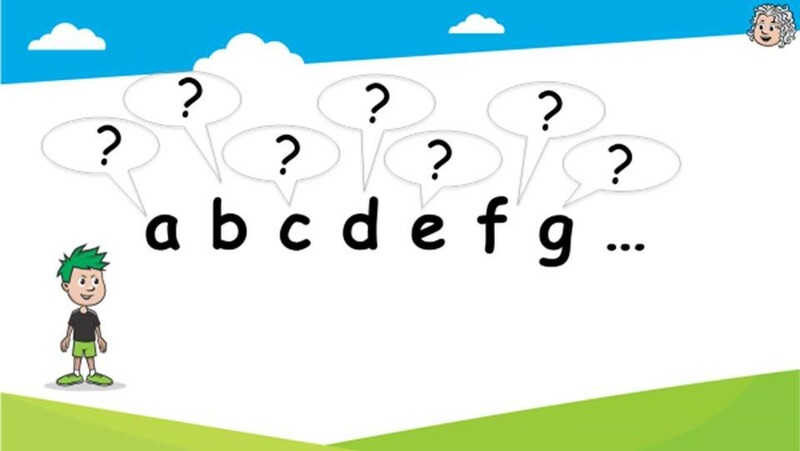 In an early childhood learning context, the focus is on the first 4 short vowel sounds (which form part of the alphabet). 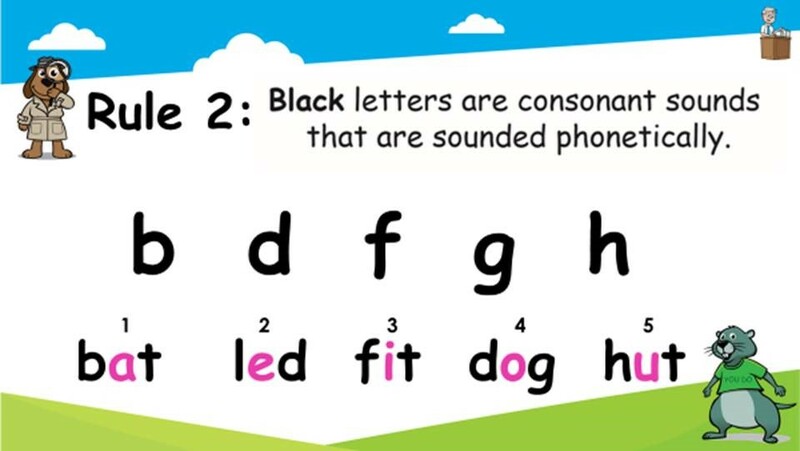 Rule 2: Black letters are consonant sounds that are sounded phonetically. These are your ‘consonants’. 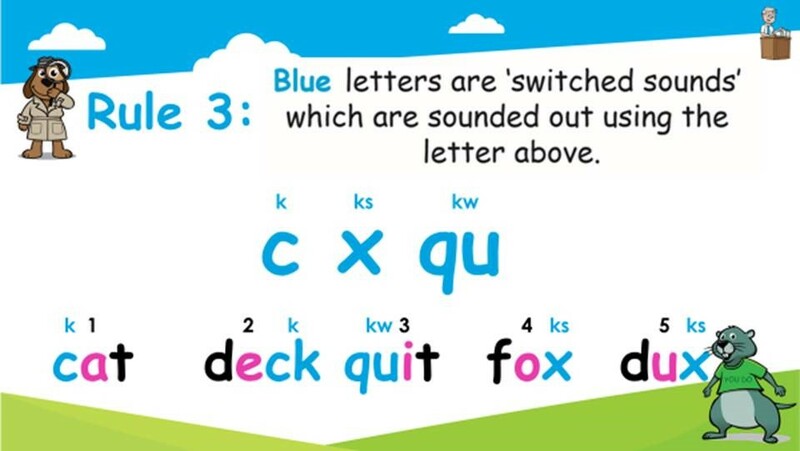 Rule 3: Blue letters are switch sounds, which are sounded out using the clue above. It is blue, look above for the clue. These are letters such as ‘c’, which can make a ‘k’ sound’ as in cake, an ‘s’ as in cent, a ‘ch’ as in cello and a ‘kw’ as in choir. Rule 4: Yellow letters are silent. Face – ‘f’ is black (phonetic sound); ‘a’ is magenta with a number 6, so makes the ‘ay’ sound; ‘c’ is blue (look above for the ‘s’ clue) so makes the ‘s’ sound; and the ‘e’ is silent, so we do not say that letter. If sounding it out it says: f, ay, s = face. Cake – ‘c’ is blue (look above for the ‘k’ clue); magenta ‘a’ is a number 6 ‘ay’ sound; ‘k’ is black. If sounding it out it says: c, ay, k = cake. 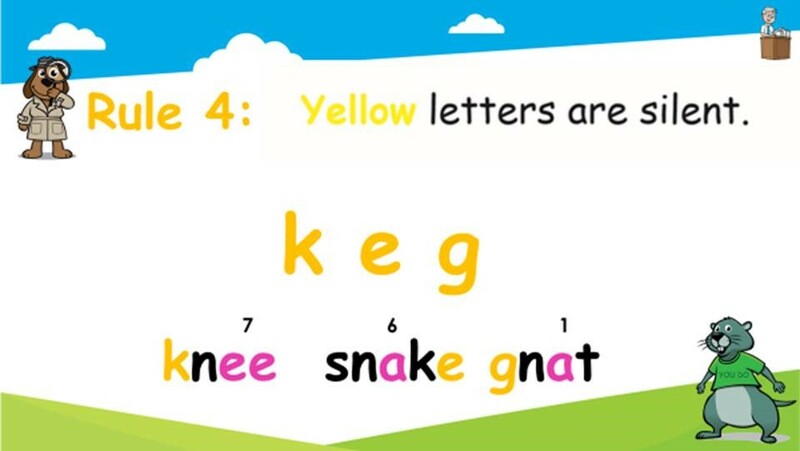 Knees – ‘k’ is yellow (silent); ‘n’ is black, so sounded phonetically; magenta ‘ee’ has a number 7 long eeeee sound; and the ’s’ is blue with a ‘z’ clue above. If sounding it out it says: n, ee, z = knees. Loveable characters embed elements of social and emotional learning into every day activities. 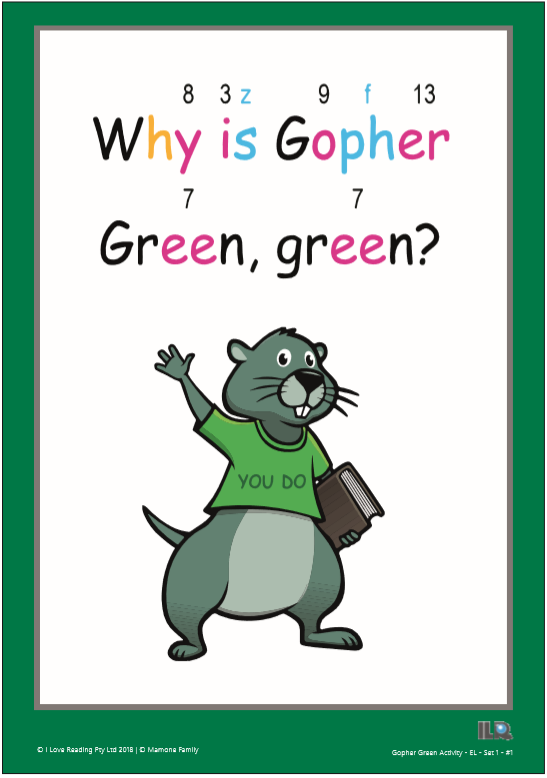 Gopher Green for example, solves problems with creativity. Welcome to the Kool Kids Genki Japanese website! 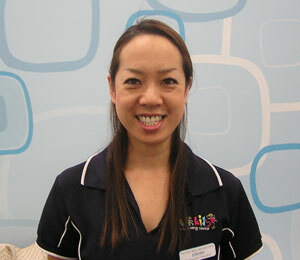 The Genki Japanese curriculum is an artistically delivered Japanese language course for young children at Kool Kids. 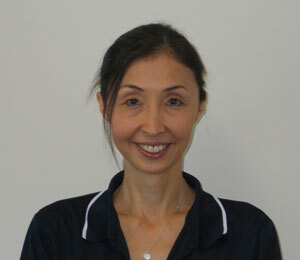 We have two fantastic Japanese teachers at our child care centres, Hiromi Sensei and Makiko Sensei.